Alter an image with fixed value impulse noise, often called salt and pepper noise. where is the probability of the noise event, is a uniformly distributed random variable in the range, is the greatest possible pixel value, and the smallest possible pixel value. Pixel alteration occurs at a user defined probability. Salt and pepper pixels are equally distributed. Definition at line 66 of file itkSaltAndPepperNoiseImageFilter.h. Definition at line 76 of file itkSaltAndPepperNoiseImageFilter.h. Definition at line 93 of file itkSaltAndPepperNoiseImageFilter.h. Definition at line 95 of file itkSaltAndPepperNoiseImageFilter.h. Definition at line 92 of file itkSaltAndPepperNoiseImageFilter.h. Definition at line 94 of file itkSaltAndPepperNoiseImageFilter.h. Definition at line 91 of file itkSaltAndPepperNoiseImageFilter.h. Definition at line 88 of file itkSaltAndPepperNoiseImageFilter.h. Definition at line 86 of file itkSaltAndPepperNoiseImageFilter.h. Definition at line 87 of file itkSaltAndPepperNoiseImageFilter.h. Definition at line 85 of file itkSaltAndPepperNoiseImageFilter.h. Definition at line 75 of file itkSaltAndPepperNoiseImageFilter.h. Definition at line 73 of file itkSaltAndPepperNoiseImageFilter.h. Definition at line 74 of file itkSaltAndPepperNoiseImageFilter.h. If an imaging filter can be implemented as a multithreaded algorithm, the filter will provide an implementation of ThreadedGenerateData() or DynamicThreadedGenerateData(). This superclass will automatically split the output image into a number of pieces, spawn multiple threads, and call (Dynamic)ThreadedGenerateData() in each thread. Prior to spawning threads, the BeforeThreadedGenerateData() method is called. After all the threads have completed, the AfterThreadedGenerateData() method is called. If an image processing filter cannot support threading, that filter should provide an implementation of the GenerateData() method instead of providing an implementation of (Dynamic)ThreadedGenerateData(). If a filter provides a GenerateData() method as its implementation, then the filter is responsible for allocating the output data. If a filter provides a (Dynamic)ThreadedGenerateData() method as its implementation, then the output memory will allocated automatically by this superclass. The (Dynamic)ThreadedGenerateData() method should only produce the output specified by "outputThreadRegion" parameter. (Dynamic)ThreadedGenerateData() cannot write to any other portion of the output image (as this is responsibility of a different thread). DynamicThreadedGenerateData() is the newer variant without threadId, and is the preferred signature, which is called by default. This variant can split the requested region into different number of pieces depending on current multi-processing load, which allows better load balancing. The non-dynamic (also known as classic) ThreadedGenerateData() signature has threadId, and number of pieces to be split into is known in advance. It is activated by calling this->DynamicMultiThreadingOff(); in derived class constructor. It should be used when the multi-threaded algorithm needs to pre-allocate some data structure with size dependent on the number of pieces (also known as chunks, work units, and sometimes also incorrectly as threads). Only PlatformMultiThreader guarantees that each piece will be processed in its own specific thread. Pool and TBB multi-threaders maintain a pool of threads (normally equal to number of processing cores) which they use to process the pieces. This normally results in a single thread being reused to process multiple work units. 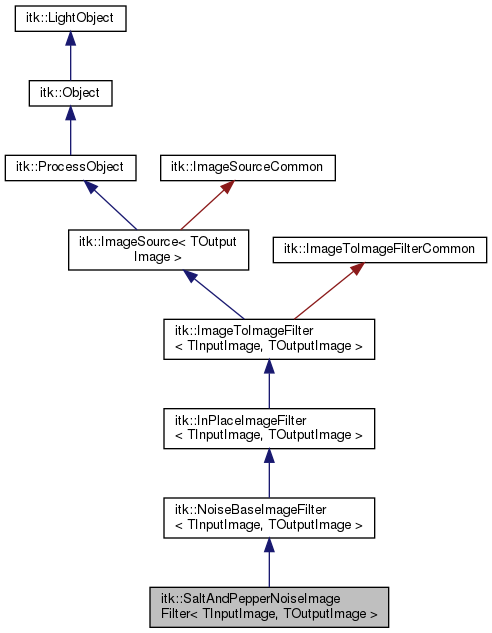 Reimplemented from itk::NoiseBaseImageFilter< TInputImage, TOutputImage >. Set/Get the pepper/low pixel value. Defaults to NumericTraits<OutputImagePixelType>::NonpositiveMin(). Set/Get the probability of the salt and pepper noise event. Defaults to 0.01. Set/Get the salt/high pixel value. Defaults to NumericTraits<OutputImagePixelType>::max(). Definition at line 137 of file itkSaltAndPepperNoiseImageFilter.h. Definition at line 135 of file itkSaltAndPepperNoiseImageFilter.h. Definition at line 136 of file itkSaltAndPepperNoiseImageFilter.h.